Yes...you are comfortable and happy here. Look at those beautiful colors. Remember the photo of you in the fabric store in San Francisco? Call and Ty had their head between their legs forever! What a great thing to bring home--a lot of fabric for making more reminders of everything you've learned a felt. I think you are cool and popular! I so loved reading your blog over the last month! 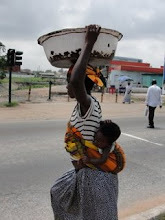 It has truly given me a desire to want to visit Ghana...after all, I do have family there! I figure if you can do it, I can do it despite all the poverty, luke warm showers, bugs, insects,...you get the picture! I can't wait to plan my trip back home!